The amount of smoke is a key element in a drift performance. The display seems more intense when 2 machines perform at the same angle and speed. 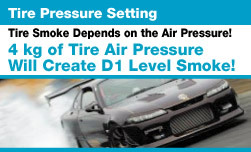 It has been proved that the main component in creating tire smoke is higher tire air pressure along with the driving style. 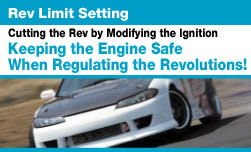 This tip will give a more appealing performance as well as increase the chance of winning at the drift competitions. The latest trend is lots of air and high grip tires!! First, we had our adviser Tanaka, take a look at Moroboshi' s driving style. Tanaka' s impression was "He's pretty good but his performance will be look more intense and stand out with more smoke." Tanaka is right. That's exactly what Moroboshi has been struggling with. The intensity of his performance is crucial in winning competitions once he enrolls in the expert class. It's not just the speed or angle, it's more than that. "I can rank up to 3rd or 4th in contests. The judges often tell me that I lack in intensity as the reason for losing at that point. I think it may be the smoke, but I haven't been trying that since I never thought that it matched my driving style," says Morosboshi. His rear tires were Rev spec tires and the tire air pressure is 2.3kg when it's cool. He had increased the air pressure up to 3.5kg to create more smoke but didn't work out so well since the tires didn't provide much grip anymore. According to the advisor, "4kg of tire air pressure with the Neova will create lots of smoke if you can still perform the way you do with the Rev Spec at 2.3kg pressure. Let's have him try it again with Neova tires. With a very nervous expression, Moroboshi claimed he won't be able to drift when he was informed that the tires he would be testing are Neovas. However, the problem with smoke was solved when the tire air pressure was set at 4kg. "I was so overwhelmed to see the amount of smoke in the rear view mirror. This is how it feels to have my sight blocked by smoke murking into the cockpit!" he said entusiastically at the pit area. The grip felt the same as that of the Rev Spec. The Neova with 4kg of tire air pressure has about the same grip as that of Rev Spec at 2kg pressure. What a great technique to increase the smoke without changing the driving style at all! Even the camera guy was amazed with the results. But one problem is the tire wear. 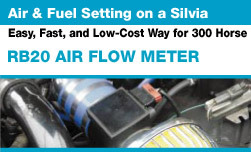 Driving with 2.3kg air pressure Neova creates less smoke and less tire wear. Maybe this technique should only be used only for one battle. It will be extremely effective to use when you want to stand out or in case of sudden death matches. Just pretend like you accidentally filled your tire up with 4kg of air! His S15 that competes in D1 has approximately 500 horsepower, so the tire air pressure for the Neova in the rear is set at 4kg for solo run, and 3~3.5kg for the tsuiso run to increase controllability. 4~5kg was common from the days he was driving on the street. He's a mid-high rank drifter who has been drifting for 4 years. His skills are at the level of entering expert class in small drift contests, and middle class for BM cup contests. His home courses are the Kanetsu Sportsland and Nikko Circuit. He ranked at 4th in last year's student drift contest. He is aiming for the top with lots of smoke this year. The test was done with Moroboshi's vehicle with a full M sports aero kit. The tires installed are 215/40 RE01R for the front and 235/40 RevSpec for the rear. He has 5 sets of Emotion CRkai rims as well. The power output is about 400 horsepower with a T517Z turbine. The tires tested are Neova tires on the rear with the air pressure of 2.3kg and 4kg, one lap for each tire air pressure. The test course was Ebisu Circuit South Course. Feeling Neova tires for the first time! "Tire pressure is amazing! But the tire became slick after drifting for 15 full minutes (the whole track) since it smoked so much. It's not so economical for our level drifters to have new set of Neova tires wear out in 15 minutes. It's best to limit the use it only when you need it at Drift Contests." It was my first time to drive with brand new Neova tires. It really grips to the road. I can manage to connect the drift, but the angle is too shallow and the performance is not very smooth. I couldn't create much smoke because of the longer period of letting off the gas. The tire didn't wear out much either. That proves that I didn't step on the gas much. It definitely doesn't grip as much compared to 2.3kg air pressure. The feeling of grip became very similar to that of Rev Spec 2.3kg pressure once tires warmed up. The heat wear didn't happen much, but the water temperature went up quick. The grip level of tires will definitely decrease with too much air pressure. This allows high gripping tires to slide better than usual. But it would be problematic if you try this with less gripping tires. You have to learn to keep on the gas for creating more smoke if you are used to entering the course without acceleration. Or else you can't make full use out of this technique.